Printing, can become one of those nagging things if you don't have it going yet. This is especially true on Linux. Though it's 2009 at this time, Linux is still lagging in printer support though that margin between Linux and Windows is shrinking rapidly. Having been already logged into my Linux partition I thought I should be able to setup a printer again without too many problems now that I took my system and upgraded from FC1 to Fedora 10+ (using steps you can find on this blog. Search: upgrade) and it should have the latest support for everything + the kitchen sink. 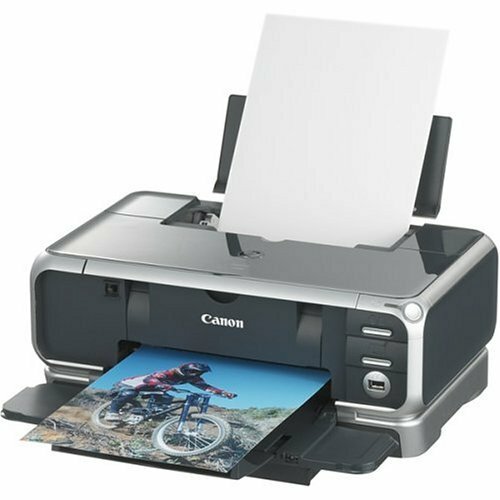 Previously, I setup my Canon PIXMA ip4000 using the below steps to print without too many issues, despite information from Canon US/Canada that NO drivers are available for my printer on Linux. As mentioned I took my Linux distro through some upgrades earlier and, in addition, my second PC where the printer is actually installed had the printer configuration changed rendering my SMB installation useless on top of the fact that the local installations were also unconfigured as well due to the upgrade. So absolutely nothing printed and off I went trying to figure out what broke. Either way is ideal for me since the printer sits between the first and second PC and is within reach by USB / Parallel cable of either PC. You may skip this step if you already found your driver or are satisfied with the postscript setting above. You may also use these steps as a starting point for finding your own drivers for your printer. As Linux distributions mature, older previously unsupported printers such as the PIXMA line of printers are now supported well in Fedora 10. NOTE: There is also a foundation called http://openprinting.org that can tell you if your printer is supported or not and where to find a driver for it. One of the sites for the ip4000 for example is http://gimp-print.sourceforge.net/ however from available documentation on the site at the time of this writing, the driver support is only experimental for Canon PIXMA iP4000 / iP4100 though it did work well in this case. NOTE: You will need to install any missing dependencies. The one you will need most likely is libcups libraries off the Fedora Core CD/DVD you have or off the ISO image. In my case this was under /mnt/cdrom/Fedora/RPMS but may use /media instead of /mnt in your case. The package will be called something like cups-libs-*. Run below command replacing the .rpm file name below with your actual file name. There are a couple of additional steps you may need to take in this case for X64 systems (My latest version of libxml2 is 2.6.23 but you should use your latest one available to you at the time). Once you setup bjfilter and create appropriate links as outlined above, you need to run service cups restart for the changes to take effect. At this point the CUPS Make/Manufacturer page should contain your printer listed as one of the choices for the manufacturer you indicated earlier. We will look at the first case initially since it's rare the printer will be within reach of two PC's and is the way I initially had to set it up since the other three means were not available to me at the time without a print server. Which should show Connected as above indicating the port is now open. This solved another issue, likely related, where the printer light just blinks sending to SMB printer but nothing interesting beyond that happens. To configure CUPS daemon itself you can use the KDE CUPS GUI cupsdconf. In this case we can use the one available through our browser as I tend to find it more informative. Click Continue again to take you to the Make/Manufacturer page so you may select your model. Select the model you have from the list. In my case when I still had an older Fedora release, the list did not contain the correct model and type of printer I had so I had to search for the correct driver to install (See above section for third party BJ Japan drivers I used) or use the postscript driver. Ultimately, due to limitations of the SAMBA driver, I used postscript instead, which was fine even for graphical printing on older Fedora Linux distributions. The above configuration will be saved to a file /etc/cups/printers.conf. 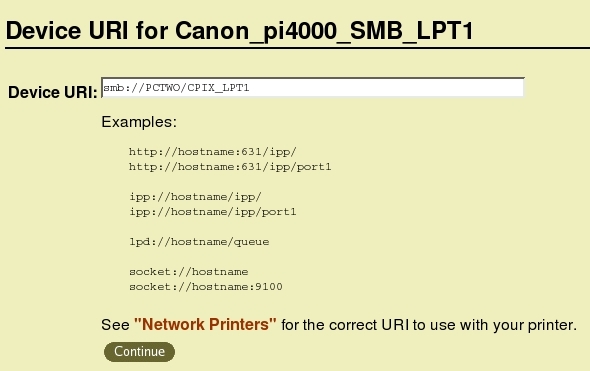 In case you wish to change the configuration manually such as the Device URI it's fairly easy to do editing the above printers.conf file directly. Select the closest matching driver to your printer from the Make/Manufacturer page. At this point click on Add Printer to save the settings. This should bring you to the first page. The Pros of this method is that I can print regardless of where the second PC is located. Proceed to the TESTING section in this HowTo to continue. when trying to print from Cups in Linux to a Windows machine through SMB. It turned out that I had to uncheck "Print directly to the printer" in Windows and click Apply then try to print from the second machine using CUPS. Instead, use "Spool print documents so program finishes printing faster" instead or another Spooling option. Bus 001 Device 012: ID 04a9:1093 Canon, Inc.
On the subsequent page, I again selected Make/Manufacturer as Canon PIXUS iP4100 Ver.2.50 (en) as I did for the SMB client. That's was it! and see if CUPS picks up your printer second time around. The new printer was installed and I tested it by printing another test page. The Pros of this method is that I can print even if the second PC is turned off. You should now proceed to TESTING below. Next came the attempt to configure using LPT1 (Parallel Port). This setup was identical to the above LOCAL USB connection setup. The only difference was which device we chose from the available options from the listed Devices. I choose the Parallel Port #1 with status readback for Canon BJ Device that was autodetected but got this further along when selecting the driver. The Printers tab of the CUPS configuration page, where you will return to once setup is complete, will now contain the printer properties for your printer. Try printing a test page by clicking the Print Test Page button/link on the page. During my installation I found that I also needed to configure the Paper Feed: option under Set Printer Options button as well to that of Cassette to have the printer take paper from the bottom tray instead of the top tray. In this case the process would be cupsd. In a new window, print the contents of some a test document by using something like cat file.xyz | lp (If you have flagged your newly installed printer as a default printer) to print, CTRL-C the strace process and look though the tracefile.dat for missing libraries and/or filters. E1: At some point during the configuration CUPS UI at http://localhost:631 started to become somewhat unresponsive and my drive light was constantly on. Turned out my CUPS log file was 3.7GB while CUPS was still doing some processing on it. which cleared the huge log file out. Of course, I opted to do this since I did not find any use for the old messages however your case may differ. You'll have to decide. N [19/Feb/2009:23:04:54 -0500] Group and SystemGroup cannot use the same groups! This finally resolved this pesky permission issue once I again restarted the CUPS service. E3: You get The PPD version (156794146) is not compatible with Gutenprint 5.2.5. Simply reinstall the printer using one of the ways above. This resolved the issue in this case. This entry was posted on Saturday, December 29th, 2007 at 3:43 am	and is filed under NIX Posts, Windows. You can follow any responses to this entry through the RSS 2.0 feed. You can leave a response, or trackback from your own site.